The East Kent Fruit Society traces it's roots back to the 1920s. The many trophies available are testimony to the long history and many have been presented over the years by generous sponsors. It is not unusual for one competitor to win several trophies, but the 2018 orchard competition saw AC Hulme & Son take six first place prizes and two runners up prizes. The very prestigious David Hilton Medal, awarded annually in memory of a member of East Kent's distinguished fruit fraternity was first awarded in 1989. For the 30th anniversary of the Memorial Medal, David's son Giles Hilton presented this year's medal to Tim Biddlecombe. In his memory, The East Kent Fruit Society decided to create an award for services to the fruit industry in Kent and beyond. The intended recipients are those who have given something back to the industry, who have not been and are unlikely to be recognised in other ways. 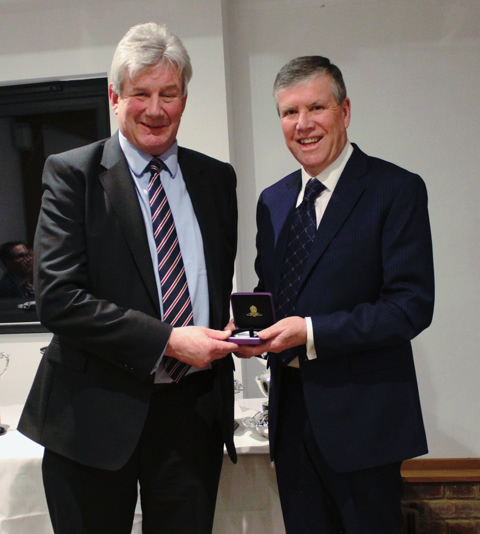 This year the East Kent Fruit Society awarded the David Hilton Memorial medal to FAST Chairman and former Managing Partner, Tim Biddlecombe, at their annual AGM. The medal was presented to Tim by David Hilton's son, Giles, in recognition of outstanding service to the top fruit industry. Tim started his career in 1972 at Wye College; from Wye Tim joined ADAS at Brodgale. Tim left ADAS to become a soft fruit advisor to FRUITCARE started by soft fruit industry stalwarts Hugh Lowe, William Pierce and Don Goodwin. In the Autumn of 1981 Tim joined Eric Gunn when Eric set up FAST (Field Advisory Service Team) advising soft fruit growers, before adding top fruit to his advisory remit. In 1986 Tim moved to Suffolk to advise East Anglian growers of top and soft fruit. When Eric retired in early 1990's, Tim and Mike Barnett took on the role of joint Managing Directors of FAST. When Mike moved onto new pastures, Tim became MD, moving back to kent in 1999. Having operated from offices in North Street, Tim managed the move to FAST's current location at Brogdale Farm 12 years ago. Three years ago Tim became Chairman of FAST passing the role of MD onto Senior Soft Fruit Advisor John Handford. Click on FAST llp for in depth information about FAST llp.